and well water for a multitude of applications in food & beverage, pharmaceutical, healthcare, microelectronics, power, chemicals, and agriculture. With models ranging from 25 to 125 gallons per minute (30,000 to 180,000 gallons per day), the smart, clean utilitarian industrial design of the X1-Series allows for convenient installation, user-friendly operation, and ease of maintenance. 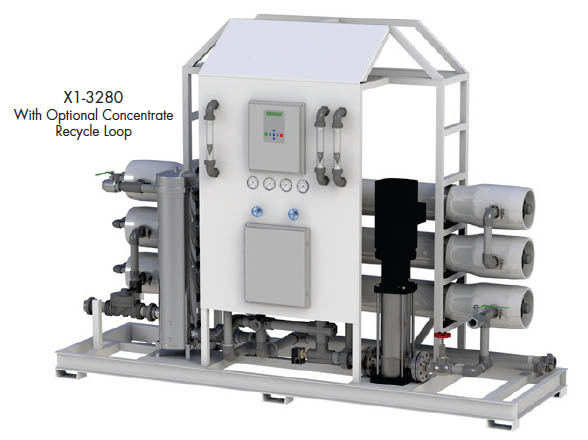 These skid-mounted, package systems are pre-plumbed and pre-wired on a powder-coated steel frame complete with a pre programmed computer, TDS probes, and panel-mounted pressure and "ow instrumentation allowing for straight forward system monitoring and control. 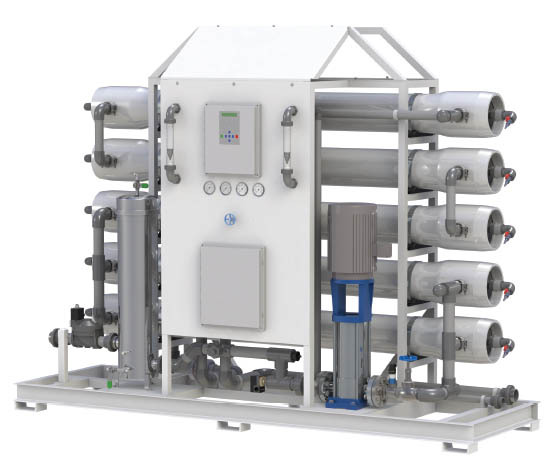 Featuring robust components selected for enhanced performance, the X1-Series includes a stainless steel vertical multistage pump, stainless steel cartridge filter housing, stainless steel valving, and FRP pressure vessels with stainless steel side ports. The larger models also include VFD motor control of the pump and a motorized feed valve. standard 8” RO elements thus producing more pure water. 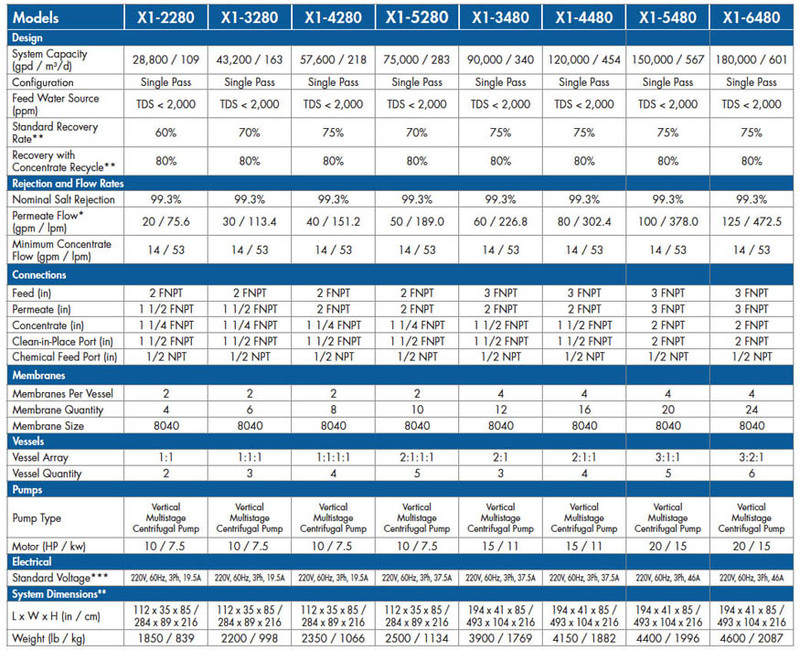 ***Option available for Models X1-2280, X1-3280, X1-4280, X1-5280. Standard on larger models. *Product flow and recovery rates are based on feedwater conditions of 2000 ppm TDS at 77oF. Treatment ability of the RO system is dependent on feed water quality. Higher TDS and/or lower temperatures will reduce product "ow. A Microbrew Applications Engineer can rate the units for these other feed water conditions. **A concentrate recycle loop is available as an option to increase recovery to 75 to 80% (if suitable to feed water conditions). ***Other voltage options are available. ^Product flow and recovery rates are based on feedwater conditions of 2000 ppm TDS at 77oF. Treatment ability of the RO system is dependent on feed water quality. Higher TDS and/or lower temperatures will reduce product flow. A Microbrew Applications Engineer can rate the units for these other feed water conditions. 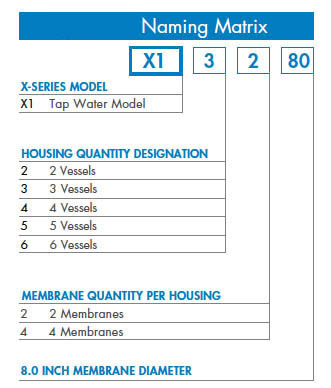 ^^Appropriate filtration must be installed in order to prevent premature membrane fouling. ^^^Scale prevention measures must be taken to prolong membrane life.